Trying to take the great black pearl. Musket fire all around,dead skwerls on the ground. The pirate skwerls will fight for rum, rum, the lovely rum. Pirate skwerl Prizm, will take a stand against the demon skwerl band. Shooting left and right,the demon skwerls will stand to fight. Prizm falls, Prizm dies, never again to see the blue sky. Launching themselves to every nook. Putting Chipper the Ripper to the test. Chipper, slaying left and right, the demon skwerls have lost this fight. Now the pirate skwerls break out the rum, WHOOZA,WHOOZA! aieeee, the squirrels are coming…..
so funny. 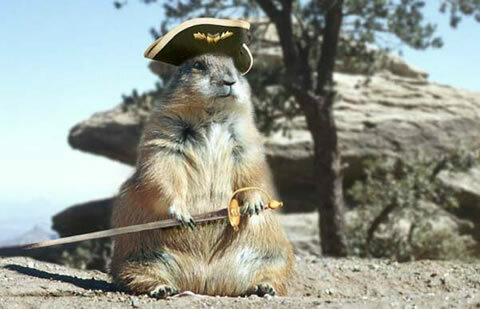 i love squirrells and pirates. but i had no idea. what an adorable little poem. just stumbled upon it.